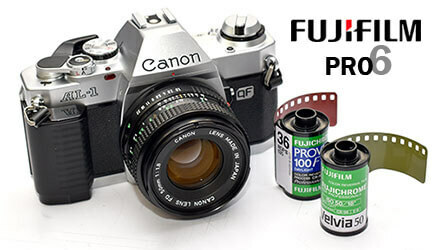 Professional 35mm, 4x5 and medium format E6 slide film processing. Accurate developing for your E6 slide film is critical to get the best color and contrast from your slides, which is why we develop your E6 slide film in the finest chemistry available, in our monitored and well maintained E6 film processor for optimum results. Our Fuji PRO6 professional E6 chemicals are fresh and are formulated to give your slides and transparency film the most consistent processing results time after time. We develop all E6 films including Velvia, Provia, Ektachrome, Agfa Chrome Fujichrome in sizes from 35mm to 4x5. We provide quality E6 film processing to photographers in the Kansas City area, as well as by mail for our customers around the country, and we'd love to help you with your E6 processing. • We use German plastic slide mounts. • Your 35mm slides are numbered and dated. • Push / pull processing is available at no extra charge. • We can cross-process your E6 film. • 35mm slide film scans are 2400x3600. • 120/220 film scans are 2400x3000 or 2400x2400. • We can upload your film scans to Dropbox if you prefer. Send your E6 film to us for processing. Download an order form and send it in along with your E6 slide film. We'll process your film and send it back fast. Looking for Kodachrome processing? Kodachrome slide film developing as black and white.